Nail surgery is not frequently performed in medical practice, by general practitioners, surgeons or dermatologists. The reason is a general unease to do more than just nail avulsions although these are very rarely indicated and are no treatment at all; most often they are performed in order not to be forced to make a diagnosis. In addition, the description of the technique of nail avulsion in textbooks of minor surgery is a crude method quite often leading to exacerbation of what ought to have been treated. Nail biopsies are extremely useful but rarely performed because the patient is usually afraid of post-operative pain and inconvenience and the physician is inexperienced and afraid to leave a post-operative nail dystrophy. Nail surgery-basic as well as advanced-requires thorough knowledge of nail's biology, physiology, anatomy, growth characteristics, its pathology as well as sterile operation conditions and excellent light. A good anaesthesia is a must. The technique of transthecalanaesthesia  for the long fingers is ideal: a single needle prick in the centre of the volar crease of the metacarpo-phalangeal joint with a no. 30 gauge needle approximately 4-6 mm deep, just until the resistance of the firm tendon is felt, allows 3-4 ml of 1% or 2% local anaesthetic to be injected. In case too much force is needed to inject, the needle is in the tendon and has to be withdrawn about 0.5-1 mm. The anaesthesia is complete within 3-5 min and works for the distal half of the finger. In addition to the advantage of only one needle prick, the neurovascular bundles of the proper digital nerves cannot be injured by the sharp needle tip. If this technique is not feasible, the proximal finger ring block is performed as the distal injection into the proximal and/or lateral nail folds may interfere with the surgery. Defects of the PNF may arise from tumour excision or trauma. Particularly in the case of tumour removal, good wound margin conditions are usually present. 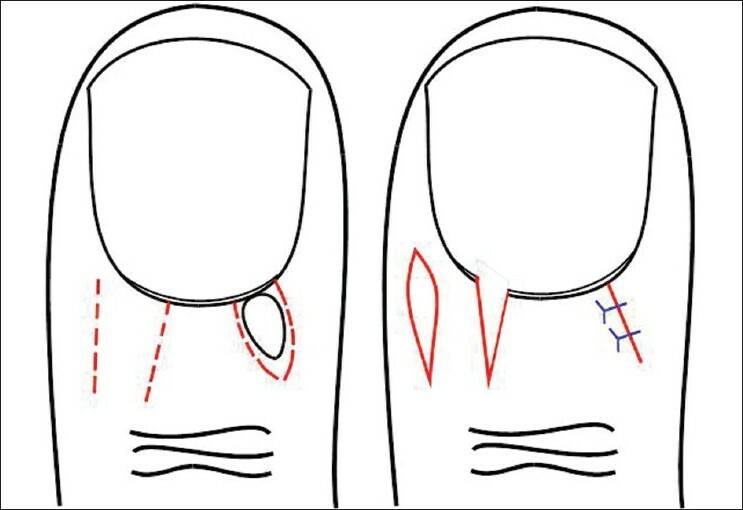 For small tumours, we devised a technique of wedge-shaped full-thickness excision with the base being at the free margin and the tip pointing proximally [Figure 1]a. , Relaxing incisions are then performed on both sides of the PNF, the two PNF flaps are separated from the underlying nail plate and the central defect is sutured without tension. Two narrow lateral defects will result that rapidly heal by secondary intention leaving no visible scar [Figure 1]b-d.
Longitudinal melanonychia continues to be a diagnostic and therapeutic challenge. Its colour does not give any hint as to its prognosis. An exact diagnosis is therefore necessary. Melanomas of the nail region make up for 1-2.5% of all melanomas in light-skinned Caucasians. About two-thirds to three-quarters of them are pigmented, and one-quarter to one-third is more or less amelanotic. Most melanomas arise from the matrix, whereas those of the nail bed and hyponychium are very rare. Pigmented matrix melanomas start with a longitudinal melanonychia; however, also benign naevi of the matrix cause a brown longitudinal streak in the nail. ,,, There is no possibility on clinical grounds alone to make the differential diagnosis of the original lesion that cause the melanin streak. Considering the appalling statistics of ungual melanoma-100 cases from Scotland had a median thickness of 4 mm  -an early diagnosis is crucial. However, since a biopsy may lead to post-operative nail dystrophy, which is not accepted in the case of a benign lesion, patients are often advised to come for follow-up examinations which they then not infrequently forget. The result may be an advanced, deep-penetrating melanoma that may already have metastasized. It is generally recommended in the textbooks to take the biopsy down to the bone. This inevitably leaves a scar in the matrix, which when the diameter of the biopsy is larger than 3 mm will transform into nail dystrophy. Based on published reports ,, and experience, with more than 50 cases of longitudinal melanonychia, ,, we have devised a biopsy technique that does not cause a matrix scar. Histopathology has shown that almost all benign melanocytic lesions of the matrix are very superficial, either foci of melanocyte activation, lentigines or junctional naevi. ,,,,, The dermis is free from melanocytes, and only an occasional melanophage is seen. Measuring the thickness of a biopsy down to the bone and of an intra-epithelial pigment lesion demonstrates that the latter is less than 5% of the entire thickness. More than 90% of a full-thickness biopsy is thus sacrificed. The experience with free matrix grafts has shown that the donor site heals without a scar when the graft is taken as a fine slice of tissue. ,,,, Such a thin specimen, consisting of approximately one-quarter of lesional epithelium and an additional three-quarters of the sublesional connective tissue as a 'safety margin', can be taken from almost the entire matrix. The donor site heals from the perilesional matrix epithelium with the help of the morphogenetic influence of the subepithelial connective tissue. Under local anaesthesia, the PNF is separated from the underlying nail plate, incised at both sides at its junctions with the lateral nail folds and reflected. This allows the origin of the melanonychia to be visualized. The nail plate is then carefully separated from the underlying matrix epithelium and partially cut transversely at the border of its proximal and medial thirds. The nail piece is then reflected to one side exposing the matrix lesion. A shallow incision is performed around it with a safety margin of approximately 1-2 mm. Using a no. 15 scalpel blade, a tangential excision is performed with sawing back-and-forth movements. The tissue slice is so thin that the scalpel blade is seen shining through it. The specimen is spread out on a piece of filter paper and immersed into the fixative for histopathological processing, which can be done within a few hours. The reflected nail portion is laid back and fixed with a single stitch through the lateral nail fold. The PNF is laid back and either stitched or fixed with Steri-strips® . Healing has been uneventful in 18 cases hitherto operated with this technique [Figure 4]. A normal nail grows out, sometimes with a tiny onycholytic area for some weeks which fully disappears over time. Figure 4: Tangential excision of a melanocytic lesion of the nail matrix. (a) Histologic photograph of a tangential excision of a junctional melanocytic nevus of the matrix showing the very superficial lesion. (b) Melanonychialongitudinalis. (c) Visualization of the pigment cell lesion in the matrix. (d) The overlying nail plate is cut away and the nevus is being tangentially removed. (e) The lesion is excised and spread on the scalpel blade to show its thinness. (f) Seven months post-operatively, only a small onycholytic area is seen in the continuation of the former longitudinal melanonychia. Using this technique, there should be no more any hesitation as to make an exact diagnosis of a pigmented longitudinal streak in the nail. Over time, we have seen less and less thick ungual melanomas due to our policy to excise all acquired melanocytic lesions in adults. , However, if the lesion turns out to be malignant, adequate melanoma surgery follows within a few days. A variety of both benign and malignant tumours are located laterally in the matrix or nail bed area and the adjacent lateral groove. When their size is too large to just excise and suture, primarily a bipedicled flap instead of Schernberg's U-shaped nail flap is proposed. Our flap design allows defects of up to 50% of the nail to be closed ,,, and is very safe. The lesion is excised in the manner of a lateral longitudinal nail biopsy from the dorsal crease of the distal interphalangeal joint to the hyponychium including a part of the lateral nail wall if necessary. The lateral aspect of the skin of the distal phalanx is dissected from the bone and a relaxing incision is made over the pulp of the digit. This permits the skin to be moved into the defect. Back-stitch sutures are used to raise the skin approximately 3 mm over the level of the remaining nail plate so as to create a new lateral nail wall. The secondary defect is left for second-intention wound healing. This technique gives excellent functional results. The cosmetic aspect depends on the size of the lesion and the defect [Figure 5]. Defects of the distal phalanx comprising the entire nail apparatus or even more can no longer be closed with a local flap. Different techniques are available to at least preserve the distal phalanx. When an early invasive ungual melanoma has to be excised, the entire dorsal one-half to two-thirds of the soft tissue of the distal phalanx is excised. Full-thickness skin is used for an immediate wound closure. It takes very well even on the bone of the distal phalanx and gives good functional and satisfactory cosmetic results. It can also be used to close circular defects such as the entire skin of the great toe [Figure 6]. 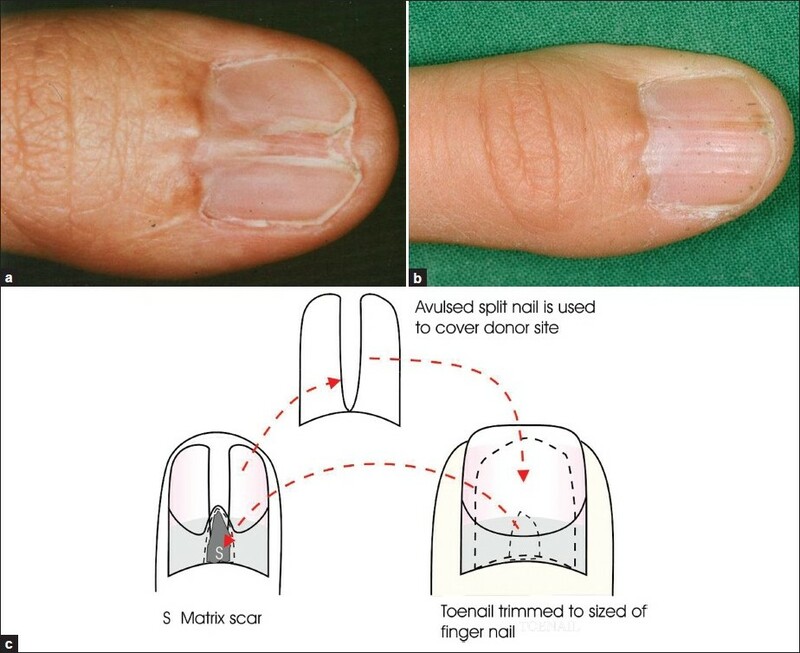 A split nail is a common consequence of a heavy trauma to the proximal nail fold that reaches down the matrix. When it is not adequately treated by layered sutures and interposition of a space-holding sheet between the wounds of the proximal nail fold's underside and the matrix, a scar forms obstructing the nail pocket and dividing the matrix into two parts, which are often in different levels and are unsightly and functionally disturbing. There are two methods to repair a split nail depending on the width of the cicatricialpterygium: excision with a meticulous repair or free matrix graft. Excision is performed by first dividing the pterygium horizontally as to re-create a new nail pocket. A narrow scar of the matrix is then excised and sutured with fine absorbable stitches. Incisions in the lateral borders of the matrix paronychial folds are proposed to facilitate the closure. In order to support this suture and prevent dehiscence which will inevitably lead to a new pterygium with split nail, the remaining nail plate parts are narrowed along their central margins by about 2 mm each and then sutured with 4-0 stitches to bring the matrix and nail bed further together. This technique usually yields a much better nail, but a completely normal nail cannot be reached because even the new narrow matrix scar is not able to form the nail plate substance [Figure 8]. For wide scars of the matrix, a free matrix graft, commonly taken from a big toe, is used [Figure 9]. The nail pocket is opened as described above, the matrix scar is superficially excised and a free graft is taken from the intact matrix of the big toe. It should be thin enough so that the scalpel blade shines through the thin slice of matrix; this will allow the donor site to heal without a post-operative nail dystrophy. Depending on the degree of scarring and nail matrix and bed destruction of the recipient nail, either the old nail is left or the big toe nail is trimmed to the size of the recipient nail and put onto the graft in order to function as a dressing and a splint for the graft, which must not dry out. The described methods for different problems require some surgical skills and experience, but are very rewarding when carried out successfully. 1. Krull E, Baran R, Zook E, Haneke E. Nail Surgery: A Text and Atlas. New York: Lippincott Williams and Wilkins;2001 (This book contains the most comprehensive chapter on the anatomy of the nail). 2. Chiu DT. Transthecal digital block: Flexor tendon sheath used for anesthetic infusion. J Hand Surg Am 1990;15:471-7. 3. Haneke E. Cirugía dermatológica de la región ungueal. Monografias de Dermatología 1991;4:408-23. 4. Haneke E. Nail surgery. Eur J Dermatol 2000;10:237-41. 5. Haneke E, Baran R. Nails: Surgical aspects. In:Parish LC, Lask GP, editors. Aesthetic Dermatology. New York: McGraw-Hill; 1991. p. 236-47. 6. Zook EG, Baran R, Haneke E, Dawber RP. 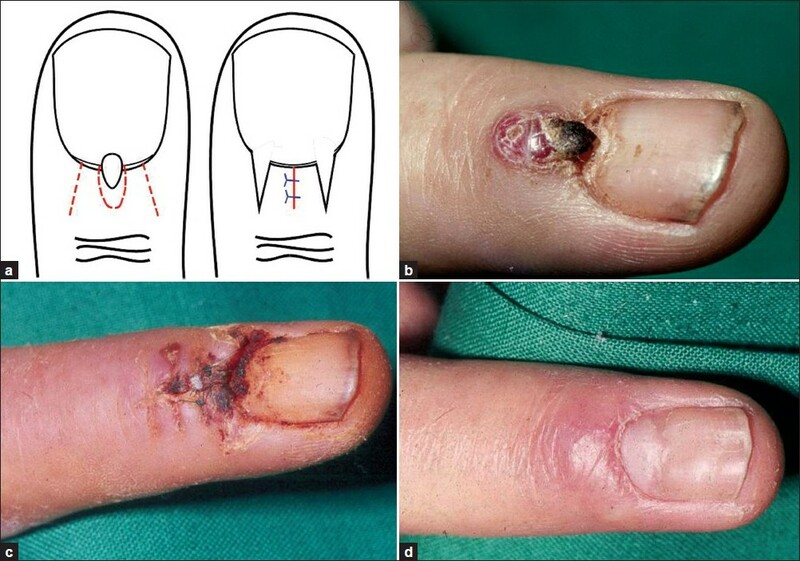 Nail surgery and traumatic abnormalities. In:Baran R, Dawber RP, de Berker DA, Haneke E, Tosti A, editors. Baran and Dawber's Diseases of the Nails and their Management, 3 rd ed. Oxford: Blackwell;2001. p. 425-514. 7. Barfod B. Reconstruction of the nail fold. Hand 1972;4:85-7. 8. Alkiewicz J, Pfister R. Atlas der Nagelkrankheiten. Pathohistologie, Klinik und Differentialdiagnose. Stuttgart, New York: Schattauer;1976. 9. Haneke E, Baran R. Diagnostik und Therapie der streifenförmigen Nagelpigmentierung. Hautarzt 1984;35:359-65. 10. Baran R, Haneke E.Management of longitudinal melanonychia. 17th World CongrDermatol, Vol Abstr II:568, 1987. 11. Baran R, Kechijian P. Longitudinal melanonychia (melanonychiastriata): Diagnosis and management. J Am AcadDermatol 1989;21:1165-75. 12. Blessing K, Kernohan NM, Park KG. Subungual malignant melanoma. Clinicopathological features of 100 cases. Histopathology 1991;19:425-9. 13. Leauté-Labrèze C, Bioulac-Sage P, Taïeb A. Longitudinal melanonychia in children. A study of eight cases. Arch Dermatol 1996;132:167-9. 14. Tosti A, Baran R, Piraccini BM, Cameli N, Fanti PA. Nail matrix nevi: A clinical and histopathological study of twenty-two patients. J Am AcadDermatol 1996;34:765-7. 15. Goettmann-Bonvallot S, André J, Bélaïch S. Longitudinal melanonychia in children: A clinical and histopathological study of 40 cases. J Am Acad Dermatol 1999;41:17-22. 16. Haneke E. Laugier-Hunziker-Baran-Syndrom. Hautarzt 1991;42:512-5. 17. Haneke E, Baran R. Longitudinal melanonychia. Dermatol Surg 2001;27:580-4. 18. Haufs M, Mainusch OM, Raguz JM, Haneke E. Longitudinale Melanonychie. Diagnose, Differential diagnose and Therapie. Dtsch med Wschr 2001;126:561-4. 19. Haneke E.Operative Therapie akraler und subungualer Melanome. In: Rompel R, Petres J, editos. Operative und onkologische Dermatologie. Fortschritte der operativen und onkologischen Dermatologie vol. 15.Berlin: Springer;1999. p. 210-4. 20. Pessa JE, Tsai TM, Li Y, Kleinert HE. 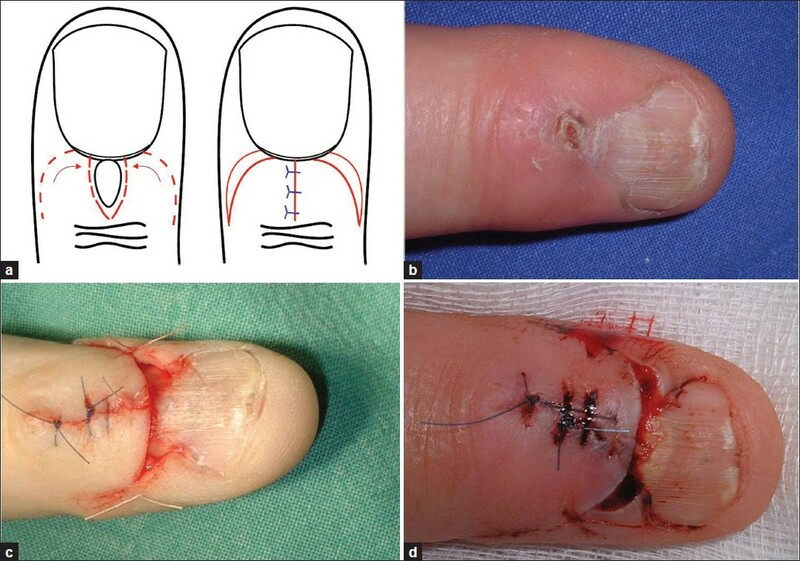 The repair of nail deformities with nonvascularized nail bed grafts: Indications and results. J Hand Surg 1990;15A;466-70. 21. Saita H, Suzuki Y, Fujino K, Tajima T. Free nail bed graft for treatment of nail bed injuries of the hand. J Hand Surg1983;8:171-8. 22. Shepard GH. Treatment of nail bed avulsions with split thickness nail bed grafts. J Hand Surg 1983;8:49-54. 23. Shepard GH. Nail grafts for reconstruction. Hand Clin 1990;6:79-103. 24. Zook EG, Russell RC. Reconstruction of a functional and esthetic nail. Hand Clin 1990;6:59-68. 25. Haneke E, Binder D. Subungual melanoma with linear nail pigmentation. Hautarzt 1978;29:389-91. 26. Haneke E. Clinical judgement. A lesson derived from a subungual melanoma. Dermatopathol Pract Concept 2000;6:73-6. 27. Haneke E. Behandlung einiger Nagelfehlbildungen. In: Wolff HH, Schmeller W (Herausg) Fehlbildungen - Nävi - Melanome. Fortschritte der operativen Dermatologie vol 2.Berlin, Heidelberg, New York: Springer; 1985. p. 71-77. 28. 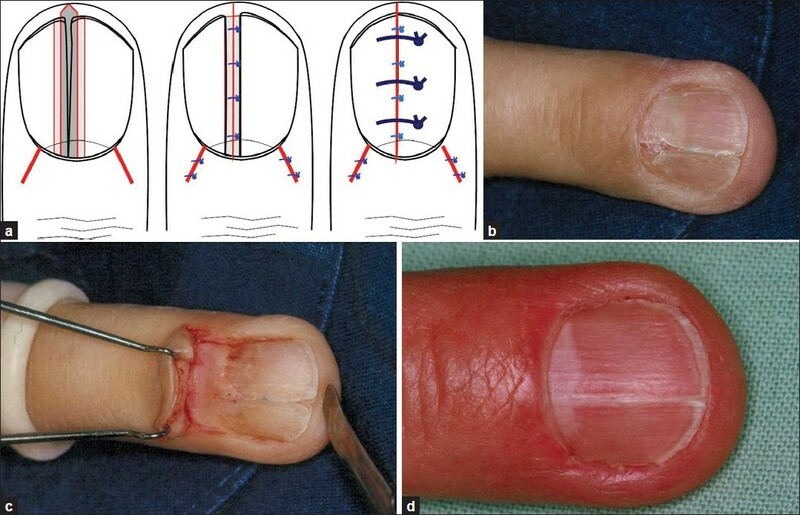 Haneke E. Reconstruction of the lateral nail fold after lateral longitudinal nail biopsy. In: Robins P,editor. Surgical Gems in Dermatology. New York, NY:Journal Publ Group;1988. p. 91-3. 29. Haneke E. Epidermoid carcinoma (Bowen's disease) of the nail simulating acquired ungualfibrokeratoma. Skin Cancer 1991;6:217-21. 30. Haneke E, Bragadini LA, Mainusch O. Enfermedad de Bowen de célulasclaras del aparatoungular. Act Terap Dermatol 1997;20:311-3. 31. Haneke E. Das umgedrehte Koriumtransplantat zur Defektdeckung im Schädelbereich. Z Hautkr 1981;56:84-7. 32. Haneke E. Versatility of dermal grafts. J Méd esthét 1981;8:122-3. 33. Johnson RK. Nailplasty. Plast Reconstr Surg 1971;47:275-26.